"The Crops Mature: A Skinning of Souls Part Two"
The X-Men battle Omega Red & Soul Skinner. 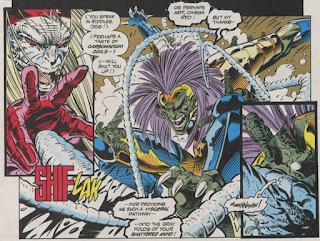 The fight between Omega Red & Soul Skinner ends with Omega Red in Soul Skinner's thrall. 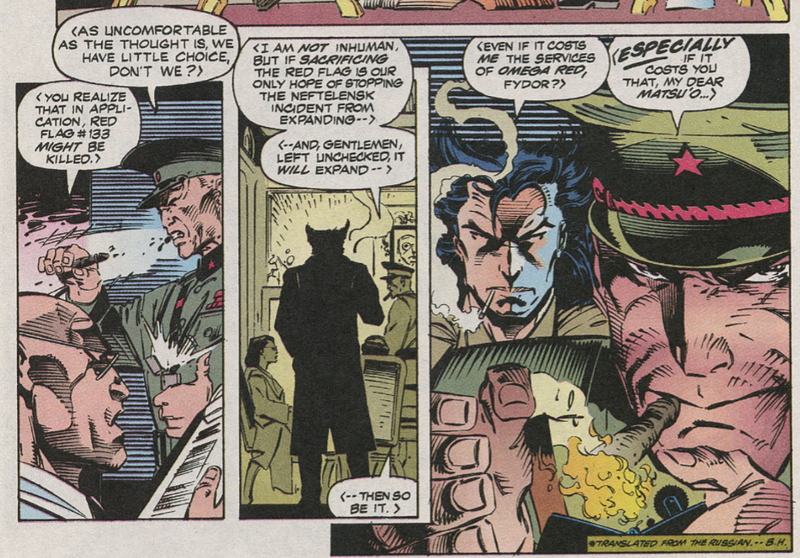 Later, the X-Men, along with Colonel Vazhin, arrive on the outskirts of Neftelensk. 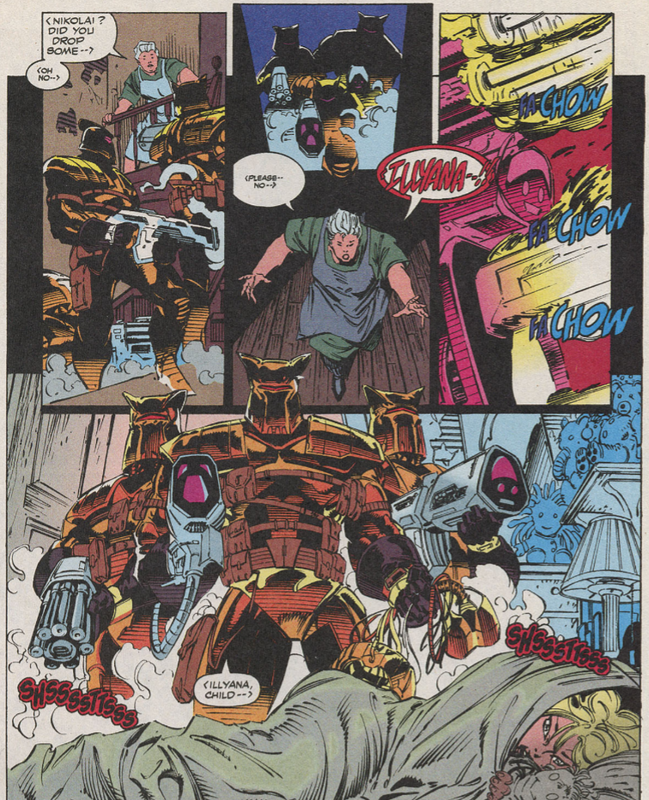 Entering the town, they find everyone, including Darkstar and Father Garnoff, unresponsive, before they are attacked by Omega Red. 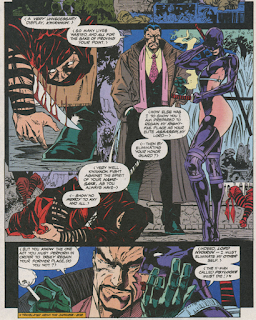 Meanwhile, Russian officials decide to activate Red Flag #133 to stop Soul Skinner, while in Japan, Kwannon is tasked by Lord Nyoirin with slaying her other self, Psylocke, before she can re-enter his service. In Russia, the combination of Omega Red and the Soul Skinner defeat the X-Men, but Colossus & Vazhin manage to escape, and discover that Soul Skinner's power does not affect children, which prompts Vazhin to apologize to Colossus, for it makes it even more certain that Red Flag #133 will be activated. Back at Colossus' home, Russian agents arrive, killing his parents and capturing Illyana, as Vazhin explains that in order to stop the Soul Skinner, his government will attempt to accelerate Illyana's age to access her latent mutant power, a process that could very well kill her. After being mentioned last issue, the Soul Skinner makes his first appearance this issue, depicted as a green-skinned person with weird prongs/leech-thingees on his knees/face (presumably on the Astral plane) and a more reserved-looking bearded man in real life. The purple-haired assassin with a grudge against the X-Men who debuted last issue gets a name - Kwannon. Her would-be benefactor, Lord Nyoirin, appears for the first time, but he's not really relevant outside of the role he plays in the upcoming Psylocke/Revanche retcon. 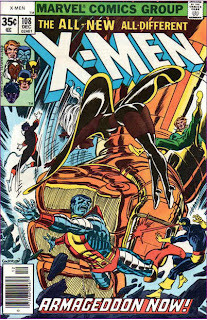 Colossus' parents are killed this issue, executed by agents of the government who capture Illyana, hoping to jumpstart her mutant power to take out the Soul Skinner, the latest entry in the running "Put Colossus Through the Wringer" subplot. 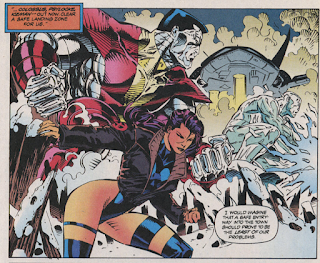 This issue is somewhat infamous for the way it depicts Psylocke wearing, along with most of the other X-Men, a fur-trimmed cold-weather jacket...over her regular "bathing suit" costume, which leaves the vast majority of her legs bare (by contrast, Jubilee, whose regular look usually involves her wearing shorts, wears pants in this story). 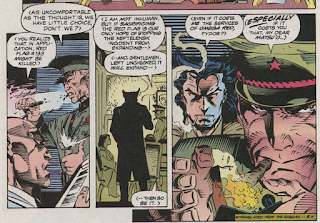 This issue seems to suggest, via Soul Skinner, that Omega Red's real name is Vasyliev Arkady, but it will later be revealed to be Arkady Russovich. Colonel Vazhin dons a suit of high tech armor this issue, meant to shield him from telepathic attack (the Russian agents who capture Illyana wear it as well). Matsu'o, who originally revived Omega Red in issue #4, is on hand meeting with Russian officials. 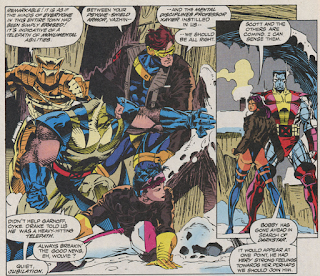 As the Soul Skinner "skins" Cyclops' mind, he sees an image of a baby with Stryfe's helmet, and comes up short when he realizes that Cyclops has also lost a child. A response to a letter in this issue mentions that a new team of X-Men is in the works, which is, I believe, the first reference to the upcoming Generation X (though that title isn't mentioned). This issue also contains two different letters pointing out the "Wolverine says he shattered a rib, but his bones are unbreakable" flub in issue #16. 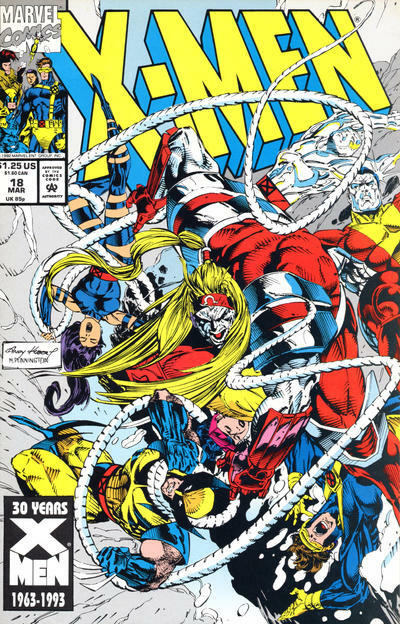 This issue opens in media res, with Omega Red having entered Nefletensk and confronted the Soul Skinner between issues. This is a technique that, when executed well, can drop a reader into a story at a moment of maximum excitement, eager to learn how events progressed to that point. When done poorly, it can be off-putting and confusing, and that's case here. It fails mostly because this opening is also the first actual appearance of the Soul Skinner. Mentioned last issue, no one has actually seen the character until the opening panels of this issue, leaving readers to monetarily wonder who the weird green vampire guy fighting Omega Red is. Instead of being excited, we're just left confused, and I'd also argue that part of the reason Soul Skinner is so forgettable (aside from this story being his only appearance to date) is in part because of how he's first introduced here. Another reason he's so forgettable becomes clear in this issue as well, as the Russian government's plans for Illyana are revealed and Colossus' parents are murdered, thus establishing that this story is, ultimately, another chapter in the ongoing attempt to push Colossus to the edge by stripping away everything he cares about (first he found Mikhail only to quickly lose him, now his parents are gone and Illyana is being threatened). As a result, this story, if remembered at all, is remembered for those elements more than it is for the villain who gives the story its name. Tomorrow, X-Force goes to space in X-Force #20. Friday, more fun with the Warpies in Excalibur #63. Next week, Uncanny X-Men #299. I'm with you on the poor use of en media res here. I had forgotten since it was so long ago, but I recall now that the first time I read this issue, I thought I had somehow missed a chapter. I can't recall; was Vazhin in on killing the Rasputins, or was this a rogue element of the government? Much as I dislike the treatment of Colossus over this year or so, I do need to give some credit to the X-office for running with a long-term plot in mind. These incidents are clearly all meant to build toward his betrayal of the X-Men, still several months away at this point. "Her would-be benefactor, Lord Nyoirin, appears for the first time, but he's not really relevant outside of the role he plays in the upcoming Psylocke/Revanche retcon." In one of those deals you often mention, since X-MEN #20 would be my first issue as an ongoing reader, I long assumed Nyoirin -- and Matsu'o -- had previously been much bigger deals than they actually were. 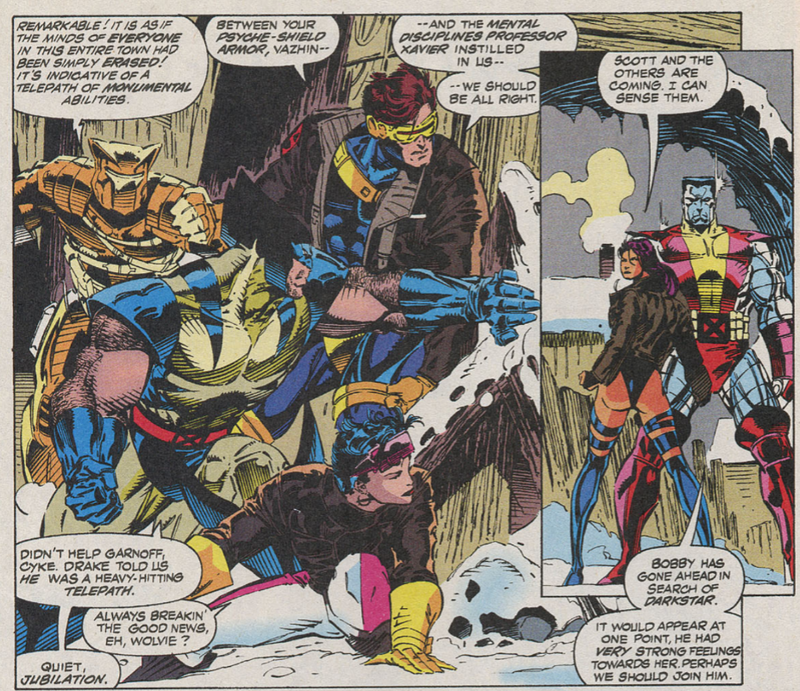 "This issue is somewhat infamous for the way it depicts Psylocke wearing, along with most of the other X-Men, a fur-trimmed cold-weather jacket...over her regular "bathing suit" costume..."
I don't get what's odd about this. Women wear coats with skirts all the time. I've often thought that women must have a much higher tolerance for cold than men. For example, my wife can wear a dress, open-toed shoes, or a low cut top in cold weather. I cannot, by comparison, wear shorts, sandals, or a T-shirt when it's cold out! I think Jubilee's outfit here was adapted into the X-MEN cartoon at some point, wasn't it? Vazhin wasn't shown participating in the actual happenstance of killing the Rasputins, but further than that it's a matter best left for the next issue. The Psylocke bare legs in snow remind me of the Teen Titans going to an arctic environmental planet where Robin (in his classic speedo-bare legs-booties incarnation) just buttons up his cape collar before going out. 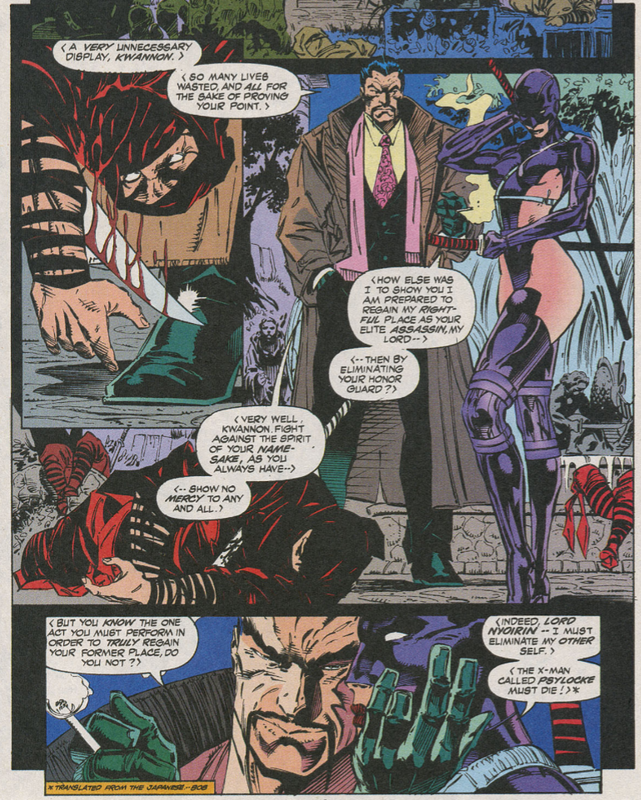 When I was a kid, I thought that lord Nyorin was an alias of the Mandarin, since they are drawn exactly alike, and since the latter had been involved in Psylocke's transformation into an Asian woman, I thought that it was natural for him to return. Then I was surprised to see that he wasn't using his powers... Blame Andy Kubert. We don’t see the bodies, here at least, so I didn’t assume that Peter and Illyana’s parents had actually been killed. Dang. That’s a pretty big deal, even if we never spent much time with them. His name could by Arkady Russovich Vasilyev — Arkady is a given name, Russovich is a patronymic (like in “Piotr Nikolaievitch” and “Illyana Nikolievna”), and Vasilyev is a family name (derived from the given name Vasily). Yeah, I got thrown a bit by the close-up combined face on the splash page, which is apparently a visual representation of the fact that Omega Red and Soul Skinner are battling in Omega Red’s mind. The fact that Soul Skinner hadn’t actually been seen yet, like you say, makes that a questionable choice of image to open with. I have no recollection of this story and I have everything from this era. I realize Soul Skinner is pretty lame but it's shocking that he's never been used anywhere else. Especially when you consider Nicieza of all people wrote the character! I could easily see him writing Soul Skinner into one of those Citizen V mini-series from the early 2000’s. X-Men sales were through the roof at this time too so it’s not like this is a forgotten era. Soul Skinner doesn't even have an OHOTMU profile!